Our organization is highly acclaimed in offering PVC Coated Gabion Box to our clients.This box is coated with polyvinyl chloride and is resistant to effects of high temperature and pressure. 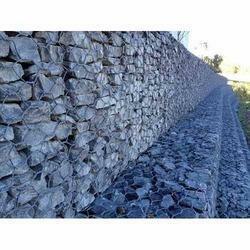 Gabions are rectangular wire mesh baskets filled with rock at the project site to form flexible, permeable, monolithic structures such as retaining walls for commercial, industrial and road projects. Looking for PVC Coated Gabion Box ?